The Stillwell Research Group participates in outreach with various community and service organizations. Read more about our events below. Dr. Stillwell and the Stillwell Research Group host the annual Girl Power event in collaboration with Abbott Power Plant, the Girl Scouts of Central Illinois, the Department of Civil and Environmental Engineering, and the Department of Electrical and Computer Engineering. 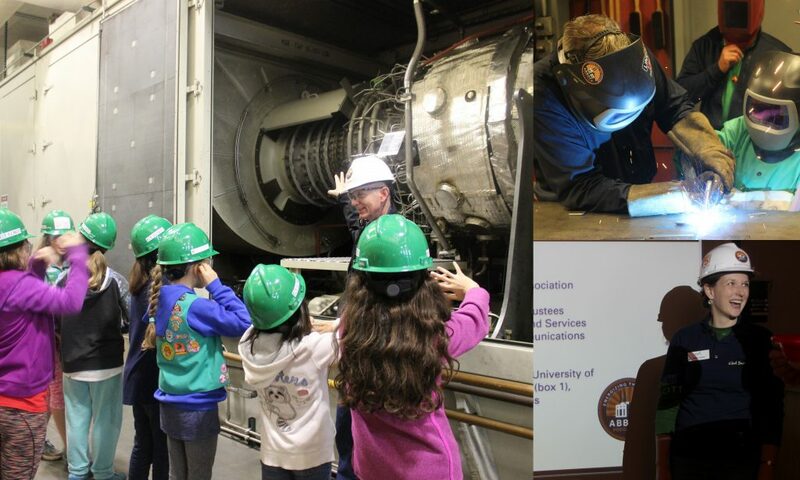 Girl Power is open to Girl Scouts in grades 3-8, and includes interactive electricity, water, and environment activities, a tour of Abbott Power Plant, and skilled trades demonstrations. For more information, contact Dr. Stillwell. The University of Illinois at Urbana-Champaign hosts Engineering Open House each spring as an annual showcase of research on campus. The Stillwell Research Group participates in various demonstrations for K-12 students in the Ven Te Chow Hydrosystems Lab.